We hope you enjoy this free printable coloring book with an alphabet theme. Use the single PDF download link above to get all the sheets in one file. If you prefer, you can browse each individual letter below. These are perfect for preschoolers or older toddlers first learning their ABCs. The letter shape is easy to color and the illustrations give some extra practice of fine motor skills. You may have seen these copied elsewhere on the internet, but these are the original illustrations by Mandy Groce created for our website in 2011. They have been used by thousands across thousands of churches, christian preschoolers, and homeschool students. They are ideal for older toddlers or any kids just learning their ABC letters. 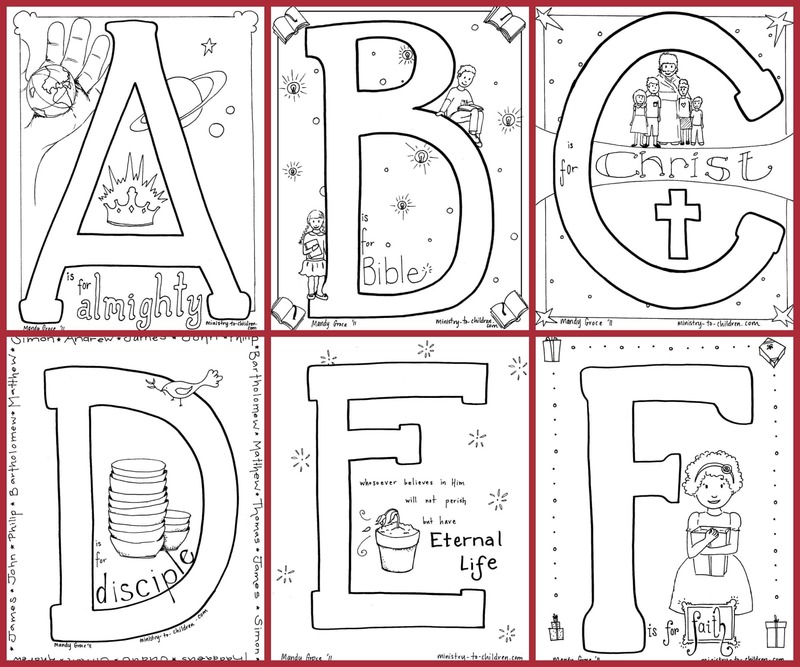 For each letter of the English alphabet, our readers are choosing the theme for to create a Bible alphabet coloring book. Get a printed edition on Amazon. One reader translated these pages into into French. If you enjoy this free material, please leave a comment below to encourage the artist. We love hearing how you use them. While you’re waiting be sure to browse all our free coloring pages. Some are based on specific Bible stories & verses while others simply follow general Christian themes. All of them are 100% free to download for your church, home, or school. This is amazing Tony God bless you. Your materials will help me in the children ministry. Your alphabets colouring section is indeed very wonderful. It helps me with Sunday school activity. Many many thnx for them. I wud also like u to please upload few items like a study plan alongwith the printables. Coz it wud b helpful on how to go abt the particular alphabet. Certain details like meaning or bible example abt the letter. Coz m myself learning alongwith the kids. I teach Children’s Church, which is for ages 3 through 3rd grade. Right now we only have 3 and 4 year olds. I am used to teaching a higher level; after searching for younger material, I came across this bible alphabet. It has been wonderful! All the young kids like to color, (even older kids if we get a visitor.) I talk about the sounds the letter makes, we look for the letter in the posters on the walls and in kids’ names. I find a short kids song that sings about the word (example: B is for Bible, so we sing the bible song.) We take time to teach the meaning of each word. I look up a scripture passage that fits the word, and we learn that verse. I teach one or two letters each week. I am compiling a book for each student to take home when this series is done, hopefully including a cd with the songs. These coloring pages were all I needed to inspire me. Thank you so, so much Mandy and Tony. Your web site is the best!!! What a blessing for me to find this site. Wow truelly God is good and always opens new door like He has done with me and for me today. Thank u for freelly sharing amd allowing many to download and share God through coloring pages and opening doors for many to come to Christ and be SAVED! God’s richest blessings be on you. This website is such a great resource! My kids’ Sunday school teacher won’t be able to teach tomorrow, so she asked me to step in last minute. Of course I headed straight to your website to find materials for the lesson she was planning for tomorrow! I’ll be homeschooling next year and will definitely be using your lessons for ideas and materials. This alphabet will be great for all of my kids when the time comes – especially to help my youngest learn letters and sound, and a “word of the week” for the older two. Keep up the great work!!! Thank you for making these available and free. I’ve been googling Bible alphabet pages every week for Sunday school and liked yours the best, and finally tracked them down to this original webpage that I can bookmark. This is a great ministry. God bless! Tony Kummer (Editor) reviewed & updated this page on : April 13, 2019 at 10:09 am. All our content is peer reviewed by our readers, simply leave a comment on any post suggest an update.